New research has revealed that online learning tools are the most important technology for British universities and these tools are twice as popular than any other type of tech. 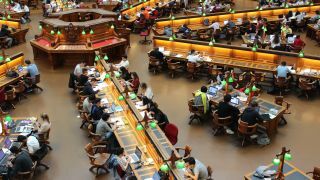 A new survey, from Jisc and ucisa, also found that 68 percent of higher education (HE) digital leaders feel the effective use of this technology is key to their digital transformation projects. Improving student experience is the biggest driver for tech adoption (91 percent) followed by improving workforce productivity (71 percent), saving costs across the organization (41 percent) and improving staff morale (11 percent). The Digital leadership in HE report also sheds light on the progress made by universities in strategic digital transformation with more than half of British universities (53 percent) having a digital strategy in place while a further 21 percent stated their strategy is integrated with others in the organization. When it came to the barriers that need to be overcome before digital technologies are embraced at UK universities, organizational culture (70 percent) was at the top of the list, followed by financial constraints (48 percent) and a lack of capability or capacity in IT (41 percent). In terms of online learning, some higher education digital leaders raised concerns that such tools undermine the worth of a physical campus but almost half (48%) of academic staff have digital tools embedded into their workflows. “It’s heartening to see HE institutions throughout the UK increasingly making progress with their digital strategies. I truly believe that the technology priorities recognised in the report – such as online learning, AI and machine learning – can result in improved experiences and greater accessibility for a wider range of students, whilst continuing to make the UK the most digitally advanced education and research nation in the world.